Band at Allentown's J. Birney Crum Stadium. George N. Parks, director of the University of Massachusetts (UMass) Minuteman Marching band for more than 30 years, died of an apparent heart attack Thursday at the age of 57. Parks may be best known to the drum corps community as the longtime drum major of the all-age Reading Buccaneers. In 13 years on the conductor's podium, he helped lead the corps to two Drum Corps Asscociates World Championships in 1979 and 1980 and was named Best Drum Major a total of eight times. He also is a member of the DCA Hall of Fame. Beginning his drum major career in 1971 at a Newark, De. high school, Parks transferred to West Chester (Pa.) University in 1973 where he soon became a staff member for the school's "Drum Major Workshop." Drum Corps International event staff member and former Crossmen drum major Jill Moyer took over as West Chester drum major just a few years following Parks in 1978 and '79. "He was just very outgoing and always welcoming. It is amazing the rapport he would have with kids instantly," said Moyer. "In high school we had gone to West Chester for a band competition. I can remember standing on the track, looking and watching the West Chester band perform. They were huge, something like 350 in number, and [Parks] was a drum major. I can remember standing and watching him, and saying to myself, 'You know what, I'm going to do that, I think I'm going to do that job.' You saw him and you were just drawn to the performance and to him. He was so engaging." A year after taking the helm as marching band director at UMass at the age of 24, Parks founded the George N. Parks Drum Major Academy. Operating since 1978, the annual summer camp has trained countless marching musicians in the finer points of drum majoring from conducting to leadership skills. Instilling in students the credo "Feet Together, Stomach In, Chest Out, Shoulders Back, Elbows Frozen, Chin Up," and most importantly "Eyes With Pride," Parks' "march offs" are always one the highlights for campers. 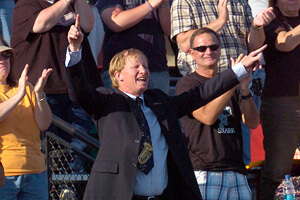 "George Parks has influenced the lives of thousands of students, both directly and indirectly and has elevated the marching band art form throughout our country and probably around the world," said Jersey Surf Drum and Bugle Corps Director Bob Jacobs who attended the Drum Major Academy as a student in '78 and '79. "The UMass students who have participated in the Jersey Surf have been outstanding examples of Parks' commitment to details and work ethic, and the countless graduates of the Drum Major Academy who have taken part in the corps have been the backbone of our program since its inception. Perhaps his greatest legacy, however, will be the invaluable lessons which his students continue to carry with them long after they've left the performance field or stage." For more than three decades, Parks has worked at UMass with a staff of prominent educators heavily involved in the drum corps activity. DCI Hall of Fame member Thom Hannum has been the associate director at UMass for almost as long as Parks has been there. "I was watching the video clip of George at the groundbreaking of UMass' new music facility and was amazed at all of the people he thanks," said Moyer. "The last person that he mentioned was Thom Hannum … I think this would have been their 30th year together. Look who else is there: Colin McNutt (Cadets), Mike Klesch (Carolina Crown), there are so many people that we see in the drum corps arena have been influenced by him and go on to teach so many more themselves. The number of people that he touches is incredible." George N. Parks, Longtime Marching Band Director, Dead at 57 (UMass.edu) George N. Parks, UMass band director, dies after performance in Ohio (MassLive.com) Photo courtesy Sid Unser.